Hotel Impossible is expanding business. Recently, Travel Channel announced season eight of the series will be paired with new show Hotel Impossible: Five Star Secrets. Season eight of Hotel Impossible premieres on October 24th at 10 p.m. ET/PT, followed by the two-episode debut of Five Star Secrets at 11 p.m. ET/PT. NEW YORK (September 22, 2016) – Hotel expert Anthony Melchiorri returns for a new season of Travel Channel’s hit series “Hotel Impossible” and his newest show “Hotel Impossible: Five Star Secrets.” In all-new episodes of “Hotel Impossible,” premiering on Monday, October 24 at 10:00 p.m. ET/PT, Melchiorri tackles some of the wildest challenges of his career as he helps struggling and dysfunctional hotels get back on their feet and on the path to success. In “Hotel Impossible: Five Star Secrets,” premiering with back-to-back episodes at 11:00 p.m. and 11:30 p.m. ET/PT, he takes viewers for an exclusive behind-the-scenes tour inside lavish hotels that have reached five-star status. Melchiorri pulls back the curtain to reveal the secrets that make these elite hotels so exceptional and deserving of the top rating – from the over-the-top luxuries to the dedicated people working there. At the end of each episode, Melchiorri chooses his “Five Star Favorite,” an employee that impressed him the most, and surprises that person with a $5,000 super tip. 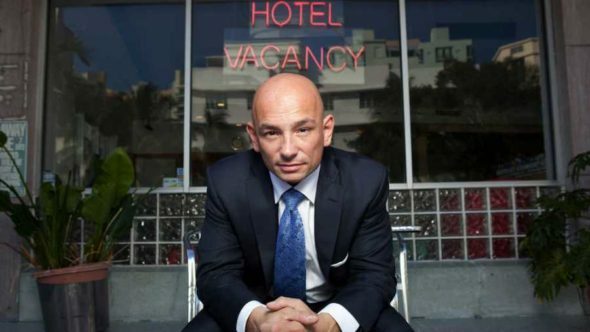 In the new season of “Hotel Impossible,” Melchiorri works his magic on not just the physical hotel transformations, he also repairs relationships, gives the necessary tools and works his hardest to create a brand new perspective for people who really need it – whether he’s in the Alaskan wilderness, a treehouse lodge in Sturgis, S.D., or even a sleep-in “safari” filled with deadly animals. Additional locations featured this season include Albany, N.Y., Bayfield, Wis., Eureka Springs, Ark. and the beach towns of North Wildwood, N.J. and Ocean Beach, N.Y. As a hotel “fixer,” Melchiorri’s in-your-face approach to business can sometimes be tough to swallow. Some owners follow his advice – others don’t. No matter what, it’s always a wild ride! What do you think? Are you a fan of Hotel Impossible? Will you check out the new spin-off series Five Star Secrets? More about: Hotel Impossible, Hotel Impossible: canceled or renewed?, Hotel Impossible: Five Star Secrets, Hotel Impossible: Five Star Secrets: canceled or renewed?, Travel Channel TV shows: canceled or renewed? BEST SHOW EVER…WE LOVE IT! I do like both parts of hotel impossible i hope to see it going for many years .